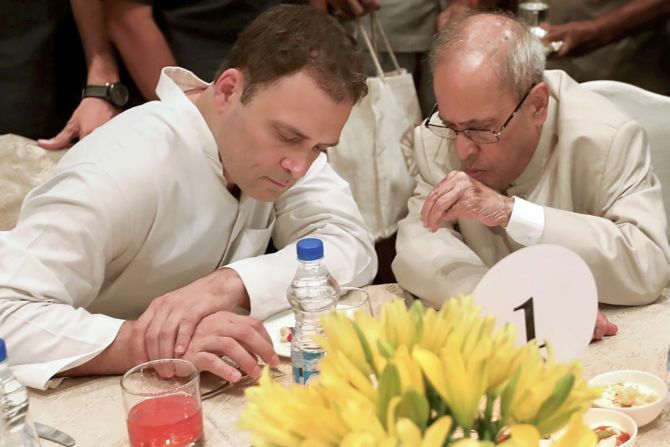 Days after a row erupted over his address at the Rashtriya Swayamsevak Sangh headquarters, former president Pranab Mukherjee on Wednesday broke bread with Rahul Gandhi at an iftar party hosted by the Congress chief. 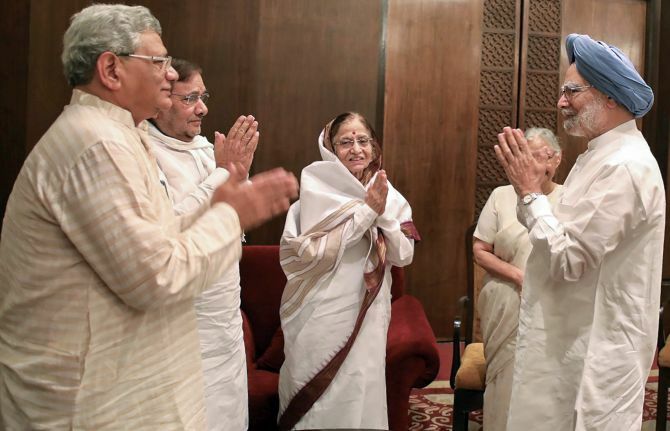 Among the prominent personalities included Mukherjee’s predecessor Pratibha Patil and former prime minister Manmohan Singh, besides former vice president Hamid Ansari besides a host of opposition leaders. 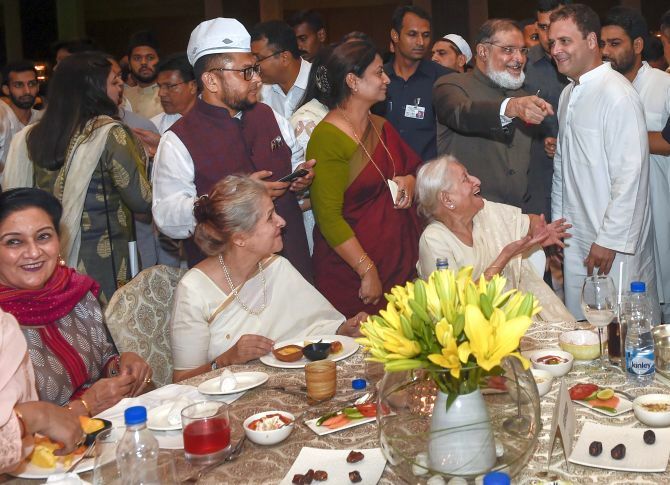 This is the first iftar hosted by Gandhi as Congress president. Among other leaders included Communist Party of India-Marxist’s Sitaram Yechury, Bahujan Samaj Party’s Satish Chandra Misra, Trinamool Congress’s Dinesh Trivedi and Dravida Munnetra Kazagham’s Kanimozhi. Breakaway Janata Dal-United leader Sharad Yadav, Janata Dal-Secular leader Danish Ali, Jharkhand Mukti Morcha’s Hemant Soren, Nationalist Congress Party’s, and Rashtriya Janata Dal’s Manoj Jha. “Good food, friendly faces and great conversation make for a memorable Iftar! 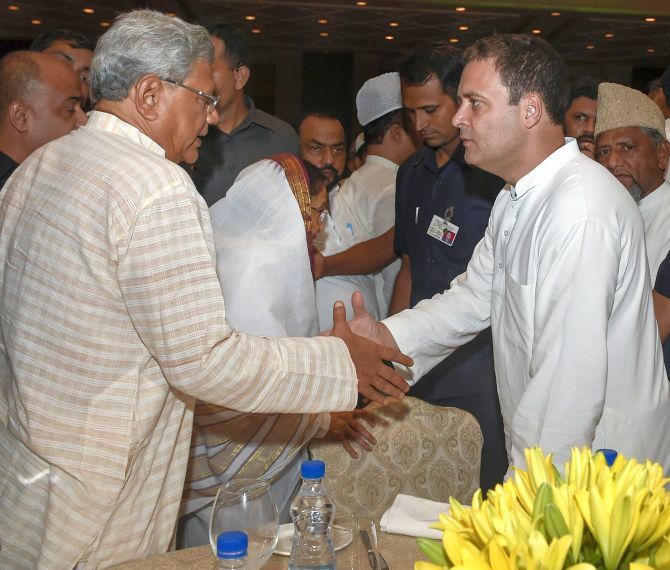 We were honoured to have two former Presidents, Pranab Da and Smt Pratibha Patil ji join us, along with leaders from different political parties, the media, diplomats and many old and new friends,” Gandhi said on Twitter after the iftar. 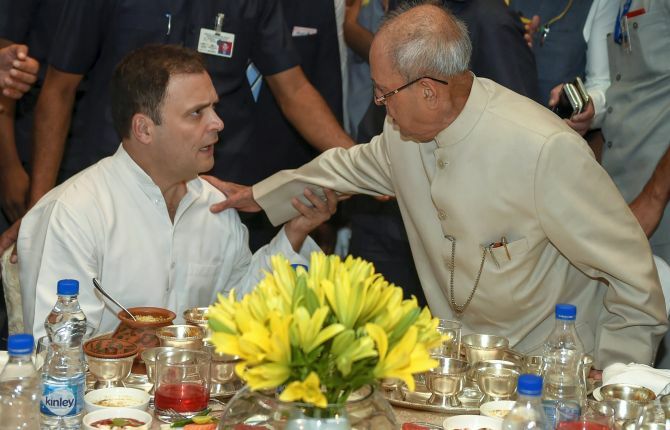 Mukherjee was seen conversing with Gandhi and exchanging pleasantries with him and several other senior Congress leaders. There was considerable disquiet in the Congress after Mukherjee accepted the invitation of the RSS to address its workers at its headquarters in Nagpur. After much consternation, the party however, later complimented him for his speech for showing the mirror of truth that carried lessons on pluralism and secularism to the Sangh. 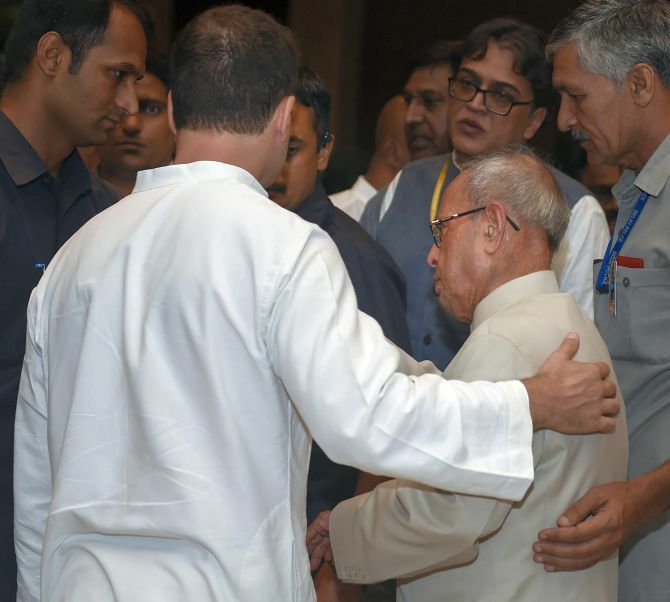 Gandhi came along with Mukherjee and while the former president left after sometime, the Congress chief offered to drop him back but Mukherjee politely refused. Besides pleasantries and photo ops, the short conversation at Gandhi’s table revolved around the prime minister’s fitness video put out by him on Twitter on Wednesday morning. Gandhi described it as “ridiculous” and “bizarre” and asked Yechury to put out his own fitness video in return, as he poked fun at the prime minister. Earlier, leaders of some opposition parties met at a different location to discuss possibilities of a larger alliance. Also present at the iftar were a large gathering of diplomats, especially from the Islamic countries, including the Ambassador of Russia to India. United Progressive Alliance chairperson Sonia Gandhi was not present as she is currently abroad on a media check up. Top Congress leaders including many former chief ministers and governors and ex-central ministers were present. These included Ahmed Patel, Ghulam Nabi Azad, Mallikarjun Kharge, Ambika Soni, Janardan Dwivedi, Anand Sharma, Veerappa Moily, Jairam Ramesh, Mukul Wasnik, KV Thomas, Shivraj Chouhan, PJ Kurien and former chief ministers Bhupinder Singh Hooda, Prithviraj Chavan and Sheila Dikshit. Ramzan2018: What is in your Iftar spread?